Magnifying Mirror 10x Wall Mounted is another common question we get these days. 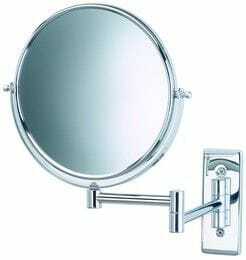 And today I will give you some information on our Magnifying 10x wall mounted mirror. Age does tend to creep up on us and we hate to admit but a bit help would not go astray when you want to put your makeup on or put your contact lenses in. For some of us it gets even harder if you already wear glasses and you need to take them off to put your makeup on. Well this fantastic 10x magnified mirror we guarantee will make your life easier. It’s like being able to see again. At this point I should warn you of two things once you have and used a 10x magnifying mirror you will never go back to anything else AND if you have never used a 10x mirror before it can be confronting if your eye sight is not so poor. When using this mirror your face will be just 4 inches or 10 cm away from the surface so your image in the mirror is not distorted. Many people think you can stand back in any position and it just gives you a bigger version of your face thinking it will make it easier to put makeup on. This lifesaving magnifying mirror 10x wall mounted will extend out 32cm from the wall. Our JP120 10x wall mount is of the highest quality comes only in a chrome finish currently with the possibility it will come soon with the gold finish. This mirror itself can be positioned from sided to side 180 degrees, is double sided and by turning the mirror you can have either 10x magnification for close up attention or 1x to see that all is in order before you walk out the door. As always I like to give you the space requirement for the magnifying mirror so you can plan the best place to put it. These dimensions can be used should you wish to place the mirror inside a cabinet which has become more popular these days. This mirror will fold back flat against the wall so its neat and tidy the dimensions are as follows with the unit folded back into the smallest possible configuration 32cm high x 26cm wide and 3cm deep. Mounting this magnifying mirror on the wall is the easiest of all with two screws provided, they should be screwed directly into timber located behind the plaster or if you have a tiled surface then drill the holes and put plastic plugs in then screw your screws into the plugs. Because we have had enquiries I need to remind you do not mount the mirror inside the shower cubicle. The mirror is real glass and can shatter easily should hot water hit the surface or if you slip and grab for the mirror on instinct it can be very dangerous. Broken glass inside a shower cubicle can result in a nasty cut. The mirrors are made from steel for strength but will rust when continuously doused in shower water. Chrome, Gold, or Brass plating will not prevent steel from rusting when they get wet with shower water everyday. A normal mounting in a bathroom will see your mirror last for a long time with the only action you need to do is keep you mirror nice and clean which can be done with a soft rag. The JP120 magnifying mirror 10x is a quality buy and should last a lifetime. Until next time remember a smile costs nothing.